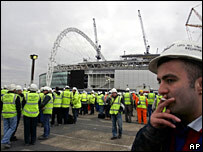 The Wembley stadium site was evacuated after a 50-tonne steel rafter slipped 1.6ft, creating an "enormous bang". The rafter was being welded in place at the time but the roof was not damaged, said builders Multiplex. Most staff are expected to go back to work on Tuesday. Multiplex boss Martin Tidd said a visit by English and German players from the 1966 World Cup would go ahead. He said they would be entertained at a part of the stadium "diametrically opposite" to the spot where the rafter slipped. Rafter no 24, found on the north roof of the new stadium, dropped without warning close to some builders at 0830 GMT on Monday. It is thought it slipped a short distance while being held in place by temporary steel connections as it was welded in place. The GMB union said it hit another piece of steelwork, creating an "enormous bang" and causing the steelwork to shudder. No-one was hurt, but most staff were sent home for the day while investigations were carried out and the rafter was shored up. "This has not affected the structure of the roof or the stadium, neither of which have moved as has been reported," said Mr Tidd. "At this point we believe that this is a minor incident, however as Multiplex has rigorous health and safety guidelines, we have taken the cautious measure of evacuating the site of the 3,000 plus workers until we have a full report on the incident." The beam, which measures about 50m long and 2m wide, is at the northern end of the stadium. Mr Tidd said they would be working "through the night" to fix the problem and most workers would return on Tuesday. The GMB union, which represents construction staff, called for a full investigation. Mr Tidd said he did not know how much the lost day would cost them, until the problem was resolved, but said he did not anticipate any builders losing a day's pay.